Choosing the perfect table cloth is the first element when it comes to designing the perfect table setting. Table cloths express a clients personal style, which allows any theme in mind to come to life. The endless selection of fabrics & colors has made Chair Covers by Sylwia the top choice for table linen rentals in Chicago, it's suburbs, and Northwest Indiana. The Chair Covers by Sylwia team is always searching for current and trendy linens, keeping up with new styles in the wedding and event industry. With a wide variety of colors, styles, and sizes, Chair Covers by Sylwia assures you, that we have the perfect table linens to compliment your special event. Let a Chair Covers by Sylwia design consultant help your ideas come to life. 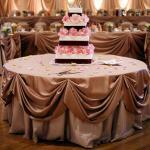 Feel free to call our office, or browse our website to find the perfect linens for your event. From an elegant wedding to a corporate meeting, Chair Covers by Sylwia has something for everyone.